Colonel Mustard, Side Of Fries, and I decided to celebrate Rosh Hashana by eating something non-kosher, and non-kosher beef with dairy on top seemed like the way to go. We headed off to Ketchy's II in Little Tokyo in Santa Monica--Asian girls are hot. Yes, there was a Ketchy's (I? ), but that one was run over by an old, Japanese gardener, and they couldn't get the property re-zoned, so Ketchy's II was the only option....and now you know. Ketchy's II is a classic, hamburger stand--outside seating only (8 seats at 4 tiny tables), so small that it barely warrants its own address, and only one or two guys can fit behind the ordering counter. For about $6.50 we got a cheeseburger, fries, and a drink. The Beef: It tasted like a lean, 90:10 Chuck. It tasted strongly of aging, which was nice. It was pretty bloodless, so the only real flavor came from the aging. The Sear: The griddle gave the burger a decent, but not impressive sear. The thin patty would have turned to dust if it was on the heat long enough to get a thick sear. 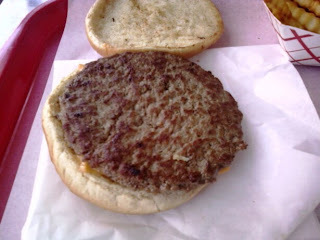 The Seasoning: There was only a hint of salt on the exterior, and not a taste of it within the patty itself. This was a damn shame, because they used a really nice seasoning blend on the fries, which would have been great on and in the actual meat. The Preparation: Griddled hard, pressed flat, Well-Done. The Bun: A standard, non-seeded, hamburger bun, but it was moist. 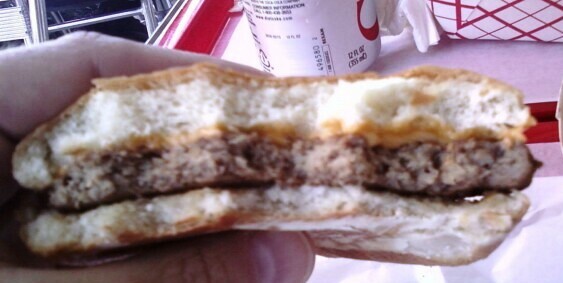 Even though it was toasted on both sides, the bun retained enough moisture to compensate for the dryness of the patty. The Meat to Bun Ratio: This was very nearly perfect--maybe 5% too much bun--if the patty had been juicy, the bun would have been dead on. The Cheese: The American cheese was perfectly melted and, when coupled with the soft bun, provided enough moisture to make for a pleasing bite that didn't require a beverage to wash down. The fries were frozen, crinkle cuts, but they were fried hard and crispy, and the seasoning was just right--it was hard to stop eating them. Did I mention that Asian girls are hot? Burger Review : Above average value for a slightly above average cheeseburger.